“I need caulk and cigarettes” was the last thing Constantin Grigorescu said to me before he travelled to the land of the dinosaurs a week too early. It was an accident, he explained later. Nobody was sure what happened. When I returned from the 7-Eleven the man and his time machine were gone. My job title was archeology intern. I had just earned a masters degree in paleontology, specializing in the Jurassic Period. The Golden Age of dinosaurs. In actuality, I was a gofer. I fetched food and shopped for parts and supplies. I didn’t know anything about quantum entanglement and its implications in time travel. Physics was Dr. Grigorescu’s domain. The project was funded by the physicist’s personal fortune, which was considerable after a lifetime of ventures in aerospace, IT, and real estate. The man had technical knowledge and charisma, and used both to his benefit. He was also an eccentric, narcissistic snob who tended to piss people off after he had a few drinks. Constantin Grigorescu was not a man to suffer fools. The time machine was to be the crowning achievement of his career. He’d spent the past decade and much of his fortune developing technology the rest of the scientific world said would never work. They were wrong. I wasn’t sure why the FBI investigated the premature launch. Is time travel a violation of federal law? I was less sure why they interviewed me. I knew almost nothing. I’d only been hired a few weeks before. The previous intern quit after repeated verbal abuse from Dr. Grigorescu regarding his bartending skills. I packed my belongings and headed back to college. Figured I’d go deeper into debt and get my PhD. That didn’t work out. To make a long story short, I spent most of the past twenty years delivering pizza. Steady work and good tips. All hell broke loose a few months ago, when Dr. Grigorescu’s time machine returned. He wasn’t in it. Unlike the accidental launch, he’d sent the machine back intentionally. Said he wasn’t going to need it again. He was having a great time in the Jurassic period not having to put up with stupid humans. He wasn’t coming back. The time machine was stuffed with priceless artifacts, guaranteed to be at least 200 million years old. Not just bones and rocks. Not just thousands of photographs and videos and a detailed journal. Actual specimens of living plants and small animals. The story caught the human race off guard. It became the most googled event in the history of the internet. Everyone involved in the project became a celebrity. Photographers and reporters waited outside their homes. But not me. The gofer never gets any attention. It occurred to me, I had always been paid in cash. It is possible I was never an official employee of Grigorescu Enterprises. The physicist was as careless about paperwork as he was brilliant. Just when it seemed I’d escaped the attention of the biggest story ever, my phone rang. I thought it was a joke pulled by my drinking buddy Ernie. He’d heard my stories about the nutty scientist I worked for decades ago. But the man on the phone had a stuffy professionalism about him. When I hung up I was thinking it might be real. Emil Janiczek was his name and he claimed to be Dr. Grigorescu’s attorney. He said the scientist had included an envelope, filled with handwritten instructions, in the time machine. A taxi showed up at my apartment and took me to the airport. A few hours later I was sitting in Dr. Grigorescu’s office for the second time. It was dusty and hadn’t changed much. During my tenure as gofer, Dr. Grigorescu would write shopping lists for me on a post it note or the back of an envelope. I recognized the penmanship when the attorney handed me a letter. Emil, this is the most important thing I want you to do. Keep in mind, 200 million years ago, all of the continents of Earth were joined together as a supercontinent, Pangea. I am in what will one day be Antarctica. Unlike 2017, it is warm and covered with vegetation. 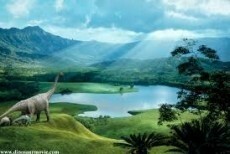 Animals roam freely, mostly dinosaurs. I live in a cave, overlooking a small lake. The lake bed is covered with a layer of fine mud. The perfect environment to preserve bones and allow them to turn into fossils. For twenty years, I have been hauling bones to the lake and throwing them in. Using the tools I brought with me, I managed to build carts and rafts to carry the larger specimens. You might wonder how I have survived so long surrounded by gigantic predators. I discovered the secret quickly: Fire. The beasts are terrified of it. Reeds grow in thick clusters near water and they burn slowly. All it takes to make the dinosaurs run is the smell of smoke. I’ve done the hard part. I’ve created the largest, most significant collection of dinosaur bones on the planet. Your job is find it and dig it up. Don’t let the fact that it is “somewhere in Antarctica” and buried under ice deter you. I left lots of money in the future and I expect you to spend it on this endeavor. This is what I know about my location. I believe the mountain fifty miles east of me is Mount Flint. Forty miles west lies what will one day be the Antarctic Ocean. My best guess is that in your version of the planet, I am at 75 degrees south, 130 degrees west. How to narrow the location down more than that? See the paper I wrote in 1996 titled Mapping Iron Ore Deposits Using Low Altitude Nuclear Magnetic Resonance Imaging.It will explain everything. Iron is one of the most common elements in the Earth’s crust and I expected to find it here. I did. The rivers and streams that drain Mount Flint contain fist sized chunks of magnetite, a type of high quality iron ore. I always fill a sack with magnetite when I harvest bones. The bones get tossed somewhere in the lake. The iron ore goes in one of three piles, forming a triangle around the lake. The piles are a mile apart from each other. After twenty years, each is the size of a small house. Big enough to create a measurable magnetic distortion, assuming an airplane flies nearby and it carries the right equipment. You’ll need a technician experienced in magnetometry and a crew that can fly an airplane in cold weather. You might get lucky and find the site in a few weeks. Maybe months. I don’t care if it is years or decades. Keep looking until you find it or the money runs out. Here’s the thing, Emil. I want this done in total secrecy. I don’t want paparazzi and thrill seekers interfering with the crew. You know I don’t trust many people. Which is why I want you to hire Tom Jackson to run the project. He was my paleontology intern when I was preparing for launch. He always kept a pack of Marlboros hidden somewhere in case I ran out and he made a damn good martini. That is good enough for me. At first I told Mr. Janiczek, “No way.” I’d never done anything like that and I thought of all kinds of ways I could screw up. But the attorney was an effective salesman. He explained that Dr. Grigorescu had instructed him to be my right hand man and to be available for advice whenever necessary. So that is how I found myself in International Falls, Minnesota. It is the fifth coldest city on the planet. Uncle Ted’s Military Superstore doesn’t look that impressive from the street, but they have an amazing selection of cold weather gear. I didn’t know you could spend $400 on a pair of boots. Mr. Janiczek told me not to worry about price tags. This made for a fantastic read, Serge. That professor seemed to have everything so well planned out! Yes, except he probably ran out of cigarettes pretty fast. Thanks. What an interesting plan. I was kinda hoping he would just go for a day and bring home a dinosaur egg. But looks like he was talking things more seriously. Loved it! I'm surprised he decided to stay where there was no alcohol or cigarettes. You never know about people. This page was created in 0.3777 seconds.